At Rocks &amp; Co., our Aquamarine rings are all variations on a blue theme! All of the gorgeous gemstones used in our assorted Aquamarine rings are fantastic matches with the earth-tones, greys, charcoals and navy blue colours of many outfits for the fall and winter seasons. Give your fall/winter outfit a beautiful Aquamarine ring accent! Do you fancy a ring design using one of the rarest, most recognized and desired gems in the world? The deep blue Santa Maria Aquamarine mined in Minas Gerais, Brazil is just that gem. Aquamarine rings featuring these gems are jewels with some of the finest gemstone samples on the planet! Then we have the Santa Teresa Aquamarine which originates from Brazil as well. A gem whose clarity and colour can rival that of its more famous sister, the Santa Maria. A classic cushion cut, emerald cut or tear-drop cut are fantastic for a stunner of an Aquamarine ring, especially when set in yellow gold, white gold, or sterling silver. The contrast of the blues with the glimmer of the precious metal is a dream, especially when enhanced by secondary white gems like Diamond, Sapphire or Zircon, making for a gorgeous promise ring, friendship ring, or a ring for any occasion at all. Welcome to the wonderful world of Aquamarine earrings! There is a Dr. Seuss list of Aquamarine earring types and designs, including long earrings; short earrings, hoop earrings and loop earrings, eternity shaped earrings, tassel earrings, stud earrings, cluster earrings, dangle and statement earrings! What are your styles? Do you have a penchant for a classic earring style? Do you feel completely in alignment with a simple, gorgeous pair of Aquamarine stud earrings? Or a simple Aquamarine drop earring featuring a Diamond, Ruby, Emerald, Sapphire, or Pearl? Most women know their own style very well and hopefully, the gift givers who love them are on board too. It's smart not to try to reinvent someone's style. At least not at the till! Although that said, a lovely pair of Aquamarine cluster earrings would not likely be stored politely in a drawer! Aquamarines rate 7.5 on the Mohs scale of hardness and are part of the Beryl family along with the evergreen Emerald. Aquamarine's recorded popularity dates back to the late 1800s - early 1900s, where the gemstone played a role in the jewellery design of the Art Nouveau period before nimbly crossing over into the Art Deco period, which ran from 1908 through the 1930s. Both periods produced sumptuous Aquamarine jewellery and prototypes that effect today's Aquamarine gemstone jewellery designs and styles. The future is now and it is the time of acquiring your needs and desires at the press of a button or the swipe of a webshop phone app. Preferably, this is all done safely with a guarantee of arrival and quality. At Rocks &amp; Co., you can rest assured that our stunning Aquamarine jewellery available online is well made, genuine and collectable. Our Aquamarine genuine gemstone jewellery pieces are set exclusively in yellow gold, white gold, rose gold, and sterling silver and are guaranteed to be always and forever made without nickel. 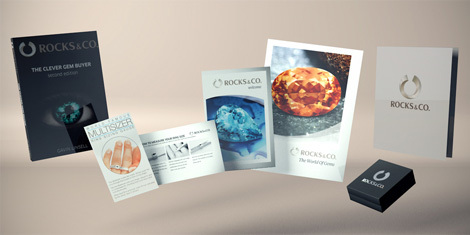 Aquamarine jewellery from Rocks &amp; Co. is delivered with a certificate of authenticity. Discover our beautiful Aquamarine jewels, at Rocks &amp; Co., your online jewellery store! Santa Maria Aquamarine pendant set in a yellow or white gold setting with diamond secondary stones is a lovely idea for an Aquamarine necklace, don't you think? In fact, if you are lucky you can find one in our store right now! Those born in the month of March are the lucky recipients of Aquamarine as a birthstone along with Bloodstone. Aquamarine a symbol of hope, health, and youth. The two Latin root words of the gemstone´s name is Aqua, meaning water, and Marina, meaning the sea. Aquamarine pendant lovers are fascinated with the fine gemstone's unparalleled blue hues. At Rocks and Co., you will find Santa Maria Aquamarine, Bauchi Aquamarine, Santa Teresa Aquamarine, Pedra Azul Aquamarine pendants and more. We offer the finest dark and light blues with our most beautiful selection of Aquamarine gemstones, mounted in and hanging from settings and chains of yellow gold, white gold and sterling silver. Like Fred and Ginger, Aquamarine and silver, as in sterling, go together perfectly, especially when the lighter blue versions of the gemstone are offset fantastically with the whites of sterling silver in a jewel design. Try matching an oatmeal coloured top and blue Capri pants with an Aquamarine sterling silver jewellery piece or set. Very Audrey Hepburn. At Rocks & Co., we have an assortment of fine cabochon cut and faceted gemstones that are used for our men's ring designs. Amongst others in the collection, there is a gorgeous yellow gold statement ring with curving rows of diamonds evoking a small classic piece of modern art. Or a there is a more straightforward version of the same theme but with straight rows of Diamonds, in a heavy yellow gold setting. There are men's rings set with crystal clear faceted cut gems like the Laos Sapphire, Cinnamon Zircon, unheated Ceylon purple Sapphire, Petalite, and our men's Aquamarine rings.